This section includes the years from 1968 until 1980. After asked the same question about 30 times, Cash finally got “yes” for an answer. In 1968 they married after being in love for a long long time. One part of the Ring of Fire was now down; their forbidden love, but Cash still suffered from a serious drug abuse. Cash had always felt great compassion for prisoners. Ever since he saw the movie “Inside the Walls of Folsom Prison” and wrote “Folsom Prison Blues”, Cash has worked for better rights for prisoners. Cash started performing in prisons in the late ‘50s, but the successfull live albums were not yet to come. But in 1968, Cash went to the prison that he used in one of his greatest hits, Folsom Prison. This concert resulted with the album “Johnny Cash at Folsom Prison”, with the powerfull rendition of “Folsom Prison Blues” as the introduction. Cash continued his prison concerts, and in 1969 he came to San Quentin. This also resulted in an album; “Johnny Cash at San Quentin”. This album contained the huge hit “A Boy Named Sue”. John also visited Österåker Prison in 1972. This was a Swedish correctional facility, and on the live album that was released in ’73, you can hear Cash speaking a little swedish in-between songs. Johnny visited the Nickajack Cave; an old Indian cave in Marion County, Tennessee. It was here that John got the spiritual epiphany that made him give up drugs. Cash also rediscovered his christian faith in the same period. And the faith in God helped him get over the abuse of drugs and alcohol. From 1969 until 1971, Cash had his own TV show on the ABC network. “The Johnny Cash Show” had celebrities coming as guests and “The Statler Brothers” opened for him in every episode. The guest list over the years included names like Neil Young, James Taylor and Bob Dylan. Johnny Cash had been close with Bob Dylan since they met in the mid ‘60s, and where neighbours in Woodstock, NY for some years. Dylan and Cash performed together on the show and in 1969, Dylan and Cash sat down and wrote the song “Wanted Man” wich you can find on the San Quentin Album. And Johnny Cash appeared on Dylan’s album “Nasville Skyline” in a duet, with Dylan, on the song “The Girl From North Country”. Them two recorded a lot of songs together, but only one song made it to release. Another artist who visited the show was Kris Kristofferson. (One of my personal favourites in country music.) He recieved a major career boost on Cash’s show, with the song “Sunday Morning Coming Down”. It was on a live performance of that song that Cash refused to please his network excecutives’ wish to change the lyrics. The song contained the line “On the sunday morning sidewalk, I wish the lord that I was stoned”. This line was a controvercial reference to marijuana, wich was not accepted by the network’s policy. 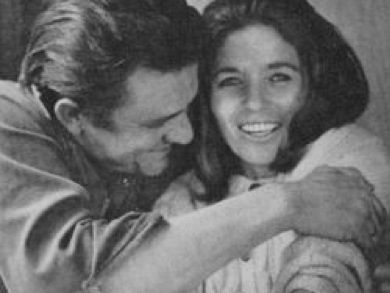 Cash made later success with song and reached #1 on the country charts in 1970. Cash himself claimes, in his autobiography, that he and his band (the tennessee two” had initially worn black because it was the only matching color they all had. And he’s said that he, political reasons aside, simply likes black as his on-stage color. Ever since he got introduced to Richard Nixon in 1972, he became friends with every U.S. President up to the last two (Clinton and Bush). The last to reigned in a period when Cash was getting worse health and he also didn’t trust the two men. In 1972, Cash was invited in to the White House to hold a concert for, amongst others, President Nixon. Cash created a little controversy here to, when he didn’t want to play the pro-war, no to drugs songs that the administration asked him to do. Cash excuced himself with not having the time to learn them, but when he replaces the with songs like “The Ballad of Ira Hayes”, “Raising the Flag on Iwo Jima”, “Man in Black” and What is truth”; wich are right about the opposite of what they wanted. Cash claimed that the presidential friends had nothing to do with politics, they were just charming persons. Although he supported the Democratic Party. Cash’s closest friend (when it comes to presidents) were Jimmy Carter. Cash had much respect for the man and what he stood for, both as president and as person. In the mid ‘70s, Cash’s popularity started to decline. His albums didn’t strike as hard on the charts as they used to, and it was now that John started to try other things. He started with writing an autobiography in 1975, wich sold 1.3 million copies. He continued to appear on TV on several occations (see filmography). And he also starred in quite a few movies (mostly tv-movies). 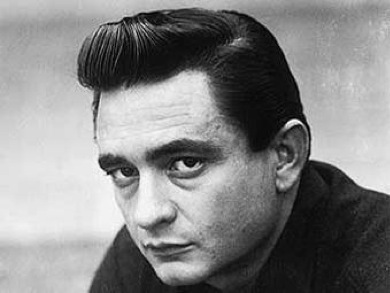 In 1977 Cash was, even though his career was declining, inducted in Nashville Songwriters Hall of Fame.